Note: Not all minor pets, bugs, and fish can be bought at the store (full list below). 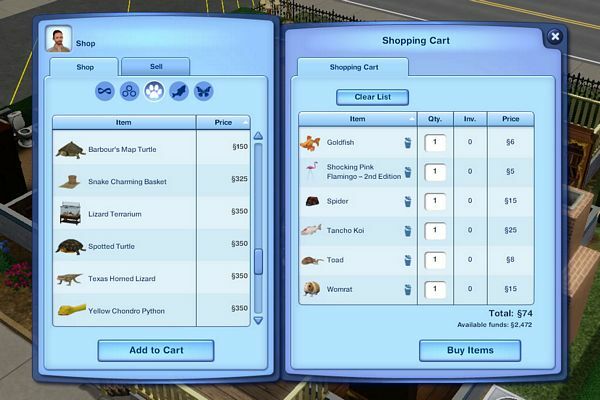 This scripting mod contains tuning for the ShopTabs XML. It may conflict with other mods that edit that resource, such as BlackCat007's Cooking & Ingredients Overhaul*. This mod was compiled against patch 1.55. It requires the Limited Edition Pet Shop. *anak_ponti has been kind enough to point a workaround for this conflict. 2013.3.21: Added optional tuning to keep EA's original tabs. Re-download if you'd like to use this tuning. 2013.6.18: Added Island Paradise fish.